The Dollar General Literacy Foundation has awarded Southern Illinois University Edwardsville’s School of Education, Health and Human Behavior $4,000 to support youth literacy. The funding aims to support teachers, schools and organizations with resources to strengthen and enhance literacy instruction. The grant is part of $4.5 million in youth literacy grants awarded to approximately 1,000 organizations across the 43 states that Dollar General serves. “We hope to use this opportunity to expand our Cougar Literacy Clinic mission with broader perspective as an interdisciplinary curriculum resource center, to encompass the integration of literacy concepts in the content areas of math, science and social studies,” said Susan Breck, PhD, professor and chair in the Department of Teaching and Learning. The Cougar Literacy Clinic provides specialized literacy assessment and a year-round tutoring program, during which educators assess and provide instruction to support K-12 students in a range of literacy skills. According to Breck, the grant funding will be used to purchase appropriately leveled, more up-to-date books and assessments that are aligned to the Common Core State Standards. Additionally, the funded materials will be available to graduate and undergraduate students in the School of Education, Health and Human Behavior to support them in planning and teaching lessons. 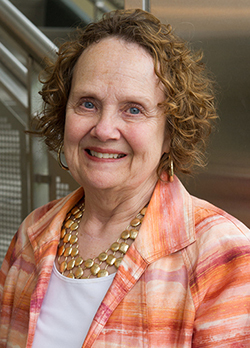 Photo: Susan Breck, PhD, professor and chair in the Department of Teaching and Learning.